To identify the opportunities for growth along the customer lifecycle, it is first important to understand the customer’s experience engaging with the company and its product or service. A customer journey map is an illustration of exactly these experiences. 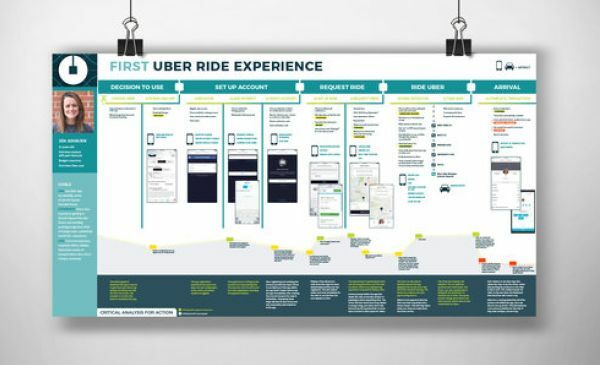 The map can tell the full story covering the entire customer lifecycle from initial contact to activation, engagement, and beyond or focus on only a part of the story that lays out interactions or touchpoints critical to a subset of the customer’s experience. We will focus on the last of these as it is the most expansive, most used, and often the most efficient in identifying big impact areas, and understanding your consumer’s full experience. For our purposes, we will be focusing on retrospective maps that are built upon more concrete data. 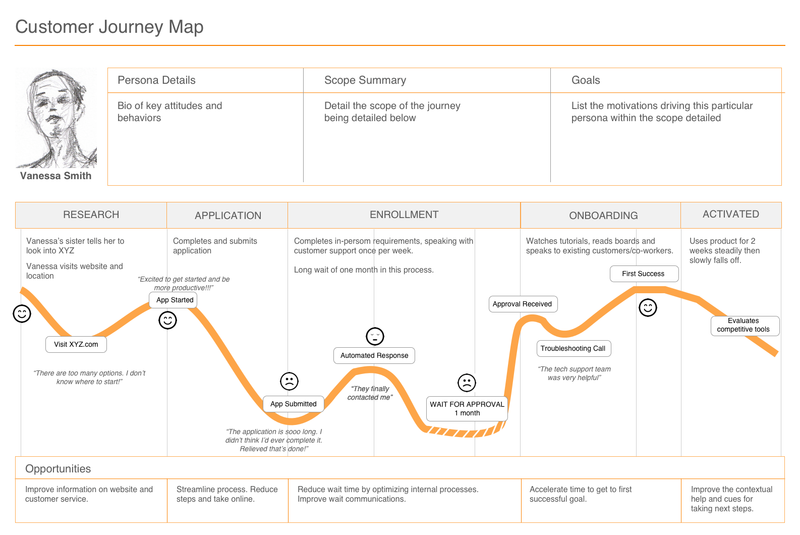 What makes customer journey maps unique to traditional funnels is that they focus on the customer’s points of view, questions, feelings, and motivations. These all blend together to explain and provide insights on the customer’s behavior. Customer journey mapping is a critical step in understanding your customers’ needs, desires and pain points. They allow you to stay focused on the consumer, and to identify the ways that you can better serve them. Before we get into the specific steps to building out the customer journey, remember that a customer journey map does not have to be a work of art, but it does need to communicate the critical things that illuminate the customers’ behaviors, thoughts and frustrations, and where the opportunities lie. Although adding pictures and making these more visual are nice, it is more important to be substantive. The journey mapping process should involve stakeholders that represent a key cross-section of functions. If selected carefully, these team members will be able to offer unique perspectives in understanding the customer. For instance, product marketing and business representatives can bring key behavior metrics and market factors, while customer support can best illuminate customer pain points with both qualitative and quantitative evidence. Having a diverse team as part of the process throughout can speed the ability to identify both organizational gaps in knowledge to drive the research phase, and opportunities for improvement throughout the lifecycle. With a cross-functional team in place, the next step is to create focus and alignment within the group. As such, the mapping process must start by clearly articulating the goals and identifying the scope of what will be mapped. The scope is defined by two dimensions: who the primary target is and what key experiences need to be traced. First, the assembled group of people in your business must agree on whose experiences are being mapped. Like a protagonist in a story, these subjects will be the ones whose perspectives, behaviors and experiences are being captured. The chosen persons should map one-to-one to a target customer segment or persona. (Personas are fictional characters who represent a specific target segment, that is, a group of customers that share key attitudes and behaviors.) Be sure that your groups are well-defined by being truly distinct and homogenous. For instance, if you are a company such as Uber offering a ride-sharing service, your personas may be a typical rider and a typical driver. These could be even further narrowed down based on usage of the application (possibly influenced by spending patterns, propensity to travel, geographic density, employment, etc.). To keep the exercise targeted, personas should likely be limited to no more than three. Second, the cross-functional team must decide on what experiences should be included in the map. The customer journey map should include paths that may be critical to the success of the business and its growth potential. Again, if you offer a ride-sharing service, critical paths for a rider could include first ride or usage, paying for a ride, various repeat ride scenarios, rating a driver, requesting a refund, sharing a location, referring a friend, deleting the app, etc. The chosen set may be influenced by the businesses priorities, however it is important to remember that some of the internal biases are meant to be challenged in this process, so a more expansive view is always better. Undoubtedly, insights can be uncovered in unlikely places. Once the scope has been clearly defined, the process usually starts by going through the steps of mapping using existing knowledge. This allows us to understand the internal ways we think about our customers before seeking out external information. 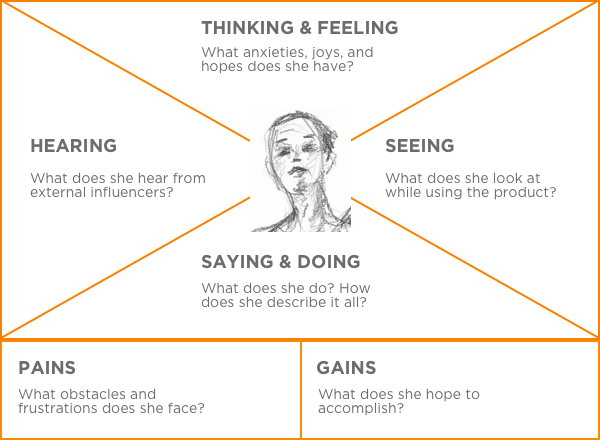 The empathy map (see below) further elaborates on the personas by capturing the feelings gleaned from all the surveys and customer observations. It serves as a good tool for helping to put oneself into the frame of mind of the customer and understand their challenges. Seeing: What do they look at while using the product, in what order and why? For example, for online banking, they may look at their account summary first to see their balances before doing any task. Hearing: What do they hear from friends, family, and the masses that influence their thoughts? Saying and Doing: How do they behave? What are the words that they use to describe the experience? Pains: What obstacles and frustrations stand in the way of accomplishing their goals? Gains: What are they hoping to accomplish? What touchpoints does the user have with the company? Direct sales, email, support, in-person events, social media etc.? The team can start considering additional touchpoints that could be used to enhance the experience. With this internal knowledge captured, the team can now lay out an initial draft of the map. This first pass will expose gaps in the knowledge of the journey, for example, what drives repeat behavior or how the customer overcomes problems with using the product. The team can now articulate theories regarding how to improve the experience or convert pains into opportunities. For example, at the end they may determine that there are not enough touchpoints or that the onboarding is failing to drive users to use the product (i.e. to activation). The goal of the next steps will be to validate, adjust and fill gaps in the journey. Additionally, we will test these theories based on research. Now that we’ve collected some internal insights, we need to conduct research to fill gaps and to test any of the theories from the internal mapping exercise. This should be done with a combination of qualitative and quantitative measures: talking to and surveying customers, prospects, former customers etc. Key tools at this point are research methods that allow us to see how the user behaves in their natural environment and while using the product in the real world. These include, contextual inquiry and ethnographic research. Both contextual inquiry and ethnographic research rely on observation and building an in-depth story directly from the customer. For the latter, the person conducting the research will observe users in their day-to-day or arrange for participants to create detailed diaries over a set amount of time. Often these two approaches are used together. For contextual inquiry, the researcher observes participants individually, while using the product or service in their regular context, i.e. in their home, office or other environment. There is an additional component of unstructured interviews that can happen throughout the observation period to aid in understanding what the user is thinking and why they perform certain actions. At the end of the research step, we should be able to articulate the key elements of the journey map: who, what, where, how, and why? Who is the customer. More directly, whom are you mapping the experience for? There may be a few that warrant more than one map, but personas should not be ambiguous or a large number. What are your personas goals, and what are they doing throughout their engagement with your company? Where are they in the journey and were all the touchpoints in each of these steps? How they achieve (or don’t achieve) their goals, and how important each of the steps may be along the way? Their feelings should also be mapped out here. Why they behave the way they do and use your product/service? This is the crux of what motivates them and the things they do. Stage: What stage of the journey does this represent? Key Activities: What is the persona doing? What is the online and offline behavior? Touchpoints: What touchpoints are employed to try to accomplish the steps? Thinking: What questions do they have? What opinions? Feeling: Are they happy? Sad? Frustrated? Confused? Opportunities: What areas for improvement have we identified? Once the journey is mapped out, and areas of opportunities identified, it’s time to act. The ideal way to focus on the most critical areas is to prioritize within the context of the business model.